Description: A green perennial plant growing 1- 3 feet tall. It has serrated leaves and blue-violet bell shaped flowers that are densely distributed on the plants stalks. Habitat: Lobelia is a common species with many native varieties found across the U.S. It grows especially well in moist, damp areas. 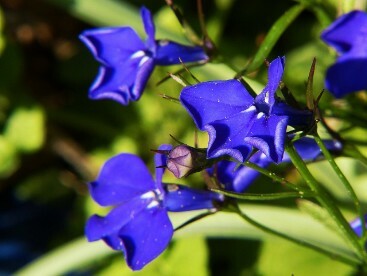 History & Folklore: Lobelia was used often by Native Americans for a number of common ailments. Both the Native Americans and European settlers believed that it had the power to cure syphilis. Early American herbalist Samuel Thomson (1769 – 1843) used lobelia along with cayenne as the main components to his herbal therapeutic practice. Medicinal uses: Lobelia is a powerful antispasmodic and respiratory stimulant, making it useful for asthma and bronchitis. When applied externally it can relax the muscles and relieve pain for sprains and muscle tension. Its chemical properties are similar to that of nicotine and therefor it is sometimes recommended for those who are trying to quit smoking. Magical & energetic uses: When taken in small doses, lobelia creates an energy of health and protection to both the physical and energetic bodies. Its occasional use may also stimulate prophetic visions. Crush the dried leaves and place them near your pillow to encourage intuitive dreaming.